In the bowl of your electric mixer, or a large bowl, combine warm milk and yeast and let sit for 5 minutes. Add egg, sugar, salt and ONE cup of flour to the yeast mixture and stir with a wooden spoon until combined. Sprinkle the remaining one cup of flour over the yeast mixture. Cove with a cloth and allow to rest in a dark corner of your kitchen for 40 minutes. When done, flour on the dough will looked crackled. Return your bowl to the mixer and fix with the dough hook (unless kneading by hand). Begin by kneading in one egg at a time, until you have added all four. Add the 1 and 1/2 cups of flour and knead on medium high speed until dough no longer sticks to the sides (this could be up to 15 minutes). Add butter and knead on medium high speed for another 5-10 minutes on or until smooth again. Place in a well greased bowl, cover and place in a dark spot in your kitchen for 1 hour or until it has doubled in size. Once doubled, punch down, and refrigerate covered, for 6 hours-overnight. Once chilled, begin to form the rolls. Cut dough into 15-20 equal pieces. Roll into balls and place on a lightly greased or lined cookie sheet spaced about 4 inches apart. Cover with a damp cloth and allow to double in size. Once doubled, preheat your oven to 375 degrees. 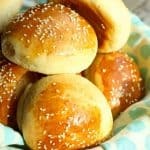 Gently baste each bun with the beaten egg and sprinkle with sesame seeds. Bake at 375 degrees for 12-15 minutes or until golden.